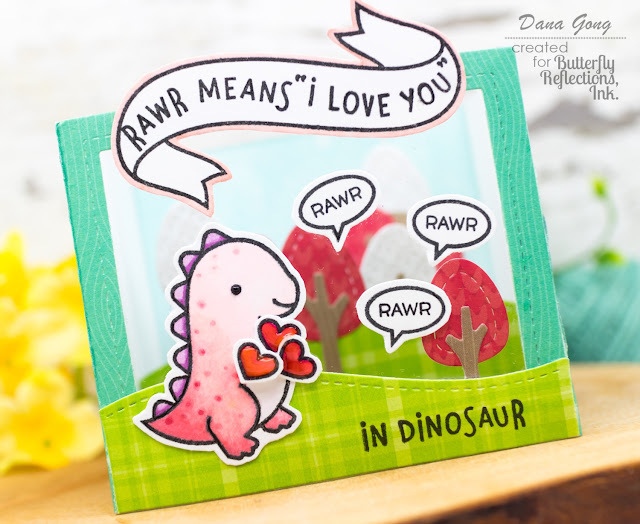 It's Dana here and I'm coming back with shadow box card featuring cute things from Lawn Fawn. To start, I die cut body of box card from LF Knock On Wood Paper Pad using LF Shadow Box Card Die 2 times and glued them together. 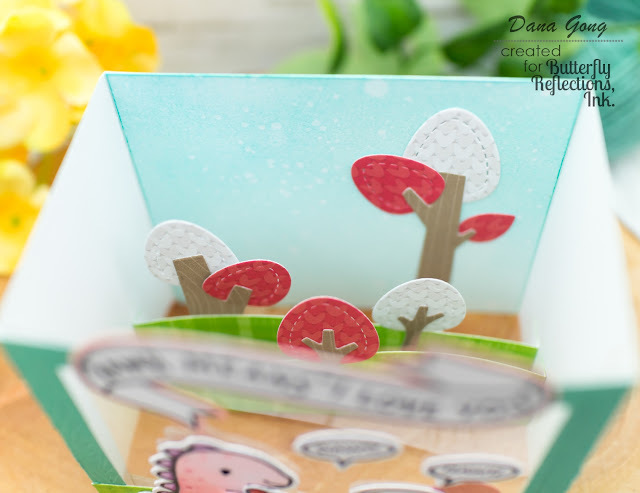 I also die cut hills from LF Perfectly Plaid Rainbow Paper Pad and tree elements from LF Knit Picky Paper Pad and Knock On Wood Paper Pad. Most of LF Knit Picky papers are winter themed, but I thought some of heart patterns would be good for Valentine's theme as well and love how them turned out as lovely heart trees. After die cutting, I glued them to the shadow box as shown in the picture. Before getting to dinosaur, I ink blended a piece of bristol paper with LF Merman and Fish Tank dye inks and splattered a bit of water. I trimmed it down to 3.25 x 2.75 and mounted inside the shadow box for background. Plus, I added acetate behind the front frame using double-sided tape. 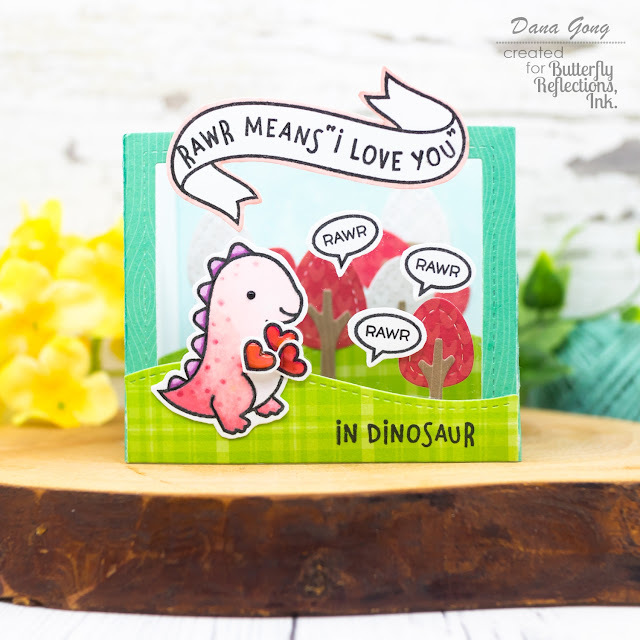 Next, I stamped super cute dinosaur, little 'rawr' sentiment bubbles and small hearts from LF Rawr stamp set. I also stamped banner image from LF Bannertastic stamp set and sentiment from LF Rawr stamp set as shown by curving the clear stamps. I stamped rest of dino-sentiment onto the front grass. Then, I fussy cut stamped images using scissors. I then colored dinosaur and hearts with copic markers. For more texture, I applied Nuvo Crystal Drops Morning Dew to small hearts and Ebony Black to dinosaur's eye. After dried them completely, I mounted all elements using glue tape to shadow box and finished off this card. Dana, this is beyond adorable!! So stinkin' adorable!!! And 3D to boot!!! !